For business owners and municipalities alike, it can be frustrating to order and install much-needed property and parking lot signs only to have those items destroyed by vandals. It is costly and time-consuming to replace such damaged signs. For those who choose not to replace those damaged signs, they can become eyesores inviting more vandalism negatively affecting the overall property. By using specially designed tamper proof hardware and anti theft hardware, you can significantly reduce the likelihood of sign damage. Though they are a bit more expensive than standard-grade hardware, theft proof sign hardware will more than likely extend the overall life and usability of your signs. By investing a little bit upfront in your anti theft sign nuts and bolts, this will potentially save you money and time in the long run by not having to replace them as often. 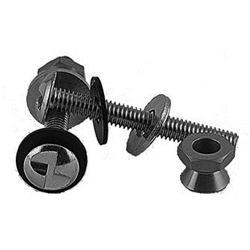 Anti theft sign nuts and bolts such as one-way truss bolt and patented “break away nuts,” as they’re called, are designed for easy installation but extremely difficult removal. Standard nuts and bolts are meant to firmly affix a sign in place for about seven years or so. Though they are made to withstand exposure to the harsh weather and environmental conditions, they are not necessarily made to withstand someone intentionally trying to dismantle the sign. A not-too clever thief could unscrew and remove the sign for himself. With anti theft sign hardware, the bolts are partially unthreaded so a special tool – not a standard screwdriver -- is needed to unscrew the sign. Moreover, vandal proof sign hardware such as the break away nut – given such a name because a portion of it breaks away when the cone-shaped portion is secured in place – are almost impossible to remove without a made-for-this-purpose tool. A would-be thief may attempt to steal the sign but would become quickly frustrated by his ill attempt to do so and then walk away empty handed. This tamper proof hardware protects your investment in your signs and ultimately your property.